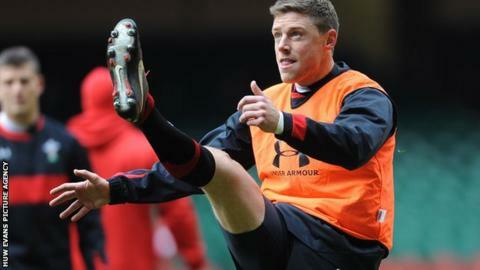 Wales and Scarlets fly-half Rhys Priestland believes he is two months away from a surprise return to action. A worst-case scenario of nine months out was the stark prognosis for Priestland after rupturing his Achilles in a Heineken Cup game in December. But the 26-year-old said: "Everything's gone well with the surgery and the rehab's going really well. "I'll hopefully be back in two months, maybe the start of April. I'd love to play a part in the Scarlets' run-in." Priestland's injury while facing Exeter came shortly after Wales' autumn series whitewash against Argentina, Samoa, New Zealand and Australia. The fly-half bore the brunt of the criticism for Wales' lack of creativity, and admitted to seeking the help of a sports psychologist after losing confidence and feeling "pretty down". While rueing the injury, which has realistically ruined his hopes of selection for the British and Irish Lions tour to Australia in June, Priestland has found benefits in having a "refreshing" break. His appetite for the game has returned, he says, and playing again far earlier than expected to help the Scarlets in their bid to finish in the top four and secure a place in the Pro12 play-offs in May is ample motivation. "I think the squad's good enough to get into the play-offs," he said. "I'd love to play a part in that because I've never taken part in any post-season games with the Scarlets."